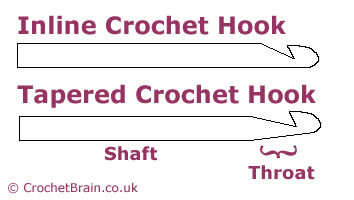 Crochet hook guide & hook size conversion table. Below is a table of crochet hook sizes in metric, UK and Canadian sizes and US sizes. Remember though that the hook size in the pattern is only a guide. Use the crochet hook size that gives you the correct tension/gauge. There are many different types of crochet hook: plastic, bamboo, soft wood, hard wood, aluminium, even ones that light up! How do you choose the best crochet hook to buy? First of all think about your own personal crochet technique. Are your stitches generally tight? Is it sometimes tricky squeezing the hook into the next crochet stitch? If so, go for a hook with a slick surface such as aluminium. Beware of the pretty coloured translucent plastic hooks, they are liable to break when forced into stitches. Tight stitches are often caused by not forming the stitch on the shaft of the hook but on the narrower shank of the hook. Using an inline crochet hook with a shorter shank can help. If your tension/gauge isn't tight, you can match the hook to your preference and to the yarn. The one thing to avoid is poorly made crochet hooks that have rough patches that will snag your yarn and make progress painful. Wood and plastic hooks are warmer to hold and lighter than metal crochet hooks. For slippery yarns, such as silk, wood and bamboo hooks have a slight grip to them which can be helpful. When buying the smaller sizes of hooks, especially the steel hooks used with crochet thread, look out for hooks with a larger ergonomic handle. Working with a very thin handled steel crochet hook for long periods of time can be uncomfortable. Using a light coloured hook with dark yarns and vice versa makes it easier to see what is going on.